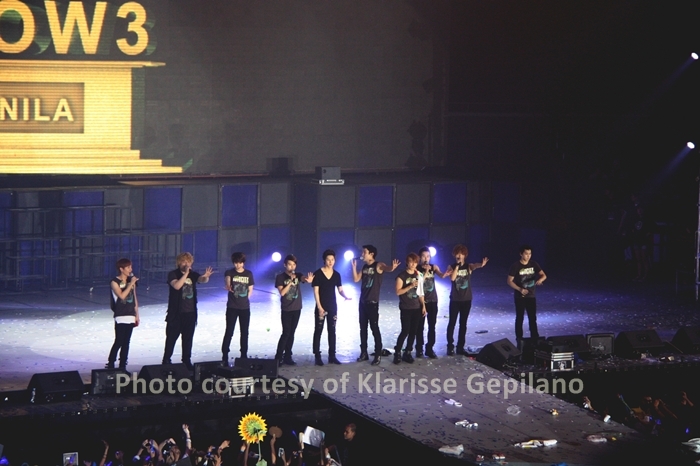 MANILA, Philippines - Korean boy band Super Junior lived up to its promise and hype as its members delivered another successful concert for Filipino fans last Feb. 26 at the jampacked Araneta Coliseum in Quezon City. The Super Junior members who performed at the Araneta Coliseum were Leeteuk, Heechul, Sungmin, Siwon, Donghae, Yesung, Eunhyuk, Kyuhyun, Shindong, Ryeowook, and Henry Lau, member of sub-unit Super Junior-M. Special guest was SM Entertainment's artist, TRAX. The concert opened with Donghae being lifted up from the stage by cables. For Dannca Francisco, 13, from San Pedro, Laguna, it was her first time to watch a Super Junior concert. "I felt very excited and nervous at the same time before the concert. But in the end I felt very happy,” she said, adding that it felt great seeing Super Junior in person. “Seeing Super Junior again, especially more closer now, was like what Sungmin and Leeteuk did! I felt like I was the one flying on air! I loved every minute of the show but the tribute for Kangin was amazing! Yesung and Ryeowook made my Saturday night like Valentine's Day! I love 'em all!” she told Bulletin Entertainment. For De Villa, who is a fan of Siwon and Donghae, said, “I love how they seem to play onstage on certain songs. Siwon, Donghae and the others are like playful children goofing around while performing and it was a fun thing to watch because they are what they are, on and off stage." Francisco, who is a huge fan of Donghae, said her favorite moment was the “Rinaldo” song. "It was when all ELFs cried because we miss Kangin and also when Henry said Philippines is the loudest [crowd],” she said.